Brand Visibility is a universal search results report providing daily rank position for brand-related pages (e.g., website, Maps, Google Business Page, Facebook business profile, LinkedIn company page, directory listings, Wikipedia bio, etc.) ranking in the top 20 Google Desktop and Google Mobile search engine results, along with position distribution, visibility trending, Page 1 coverage, and category of results. A SERP Snapshot displays the actual Top 20 rank results, Top AdWords Ads and Google Related search phrases. This report can be viewed in the Enterprise Management Reports section of Rank Ranger. This interactive report is available in your Rank Ranger user interface and White Label Client Dashboards. It may also be added to automated White Label email PDF reports and/or exported to an individual PDF. The Positions Distribution Chart provides the total (for all keywords in the campaign) number of times any of your brand pages rank in the top 20 search engine results on the day the report is run. The dark gray line represents the baseline number of times brand pages ranked in the top 20 on the day we began tracking the Brand URLs. You can hover over the chart to view the actual numbers. The Visibility Graph displays the trend of the brand's visibility for the selected search engine over the past 6 months (or less if the campaign has not been in Rank Ranger for that period of time). This is based on the position of the site's ranking keywords and average search volume (learn how visibility score is calculated). You can hover over the graph to view the Visibility Score on any date. The Results Page Type pie chart provides a graphic representation of the number of the brand top 20 search results by type - Organic, Maps, Social, Apps, Directory and 3rd party sites. You can hover over any section in the pie chart to view the number of positions for that page type. In the Top 20 Positions column, if the brand ranks for the associated keyword in the top 20 SERP results, you'll find the Rank and type of brand page along with a logo icon, if available. If an icon does not display for the page type, you can hover over the area between rank and third party to reveal the URL. The Total Positions column is the total number of positions each keyword scored in the Top 20 search results. Click on the Discovery icon to launch the actual Top 20 search engine results. You can scroll through the results to view each of your brand landing pages that are ranking in the top 20, as well as where your competitors are ranking (and see their page titles and meta description text). Also, discover which listing services your brand might need to be added to. Right-click on any link and open the page in a new tab or window to view the page content. 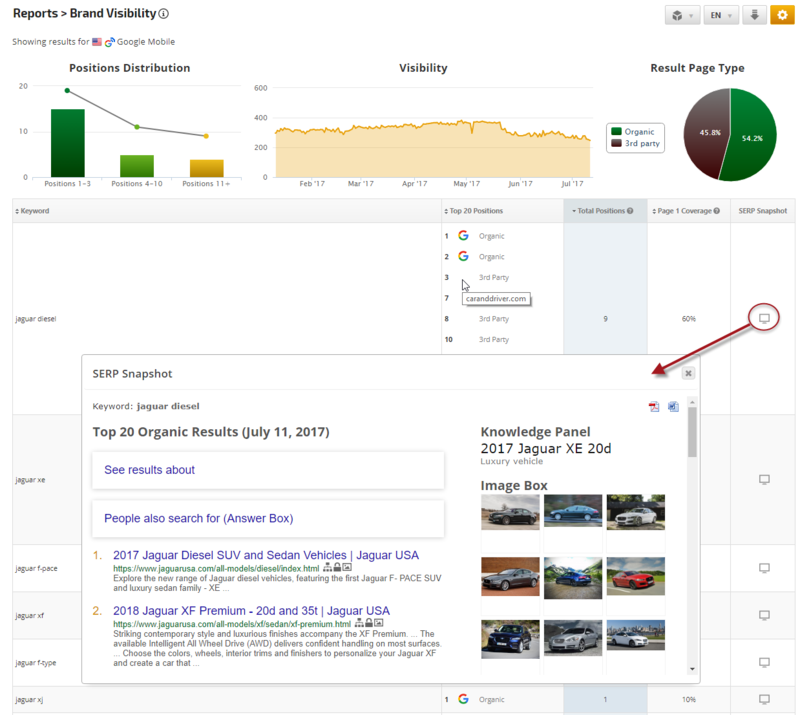 Note: the SERP Snapshot option is available in your Rank Ranger user interface and White Label Client Dashboards, but does not display in automated PDF reports. If there are advertisements associated with the keyword, you can view the Top AdWords ad titles and content (possibly competitor content that has helped them to rank in the top ad positions). If Google provides related search phrases for the keyword, this report includes up to 8 related search results. This is an Enterprise account feature, so if you don't see the Brand URLs screen and you want to use this feature, please contact customer service regarding an upgrade. Enter full URLs of brand-related pages (e.g., social media profile pages, directory listings, etc.) one URL per line in the URL Address field. Full URLs should be entered in this format: www.facebook.com/amazon or https://www.cnet.com/news/amazon-dash-buttons-make-their-way-online/ (the software will remove the https:// for you). After clicking the Add button, you should see a Success message. When these pages rank in the top 20 search engine results, their rank position will display in the Enterprise Brand Visibility report. If you attempt to add a brand URL that already exists in the campaign, you will receive this error message. The maximum number of keywords allowed for this report 200 keywords. When you add keywords to a campaign you need to open Report Options and check the boxes beside the new keywords or click the Reset button to display all keywords in your report. Select the tag(s) you want data included for in the report. This is especially helpful when working with campaigns tracking a large number of keywords, for example, if you're tracking 250 keywords for a restaurant and 30 are brand-related, 200 are menu items and 20 are related to a community project the company is sponsoring, you can this report to display only 1 of those tags at a time, changing the custom title for each version of the report and saving them using Report Presets. Select the Search Engine that you want results displayed for. Designed for marketing professionals who manage major brands or large numbers of clients, Rank Ranger Enterprise provides scalable access for teams, ensuring that everyone has the tools they need to be successful. Campaign Archive allows storage of campaign settings and history for future reference, and ability to reactivate campaigns when needed, for efficient management of account resources.